A tradition I have taken from my Mom is the ornament of the year. Every Christmas since PR Dad and I have been in this house we have bought an ornament. We have had some big events in the last 6 years that we have lived here and we have some great ornaments. This year we could not think of a big significant event so we went with what has keep The Phi's attention all year. Snoopy. She has watched almost every Charlie Brown special out there from It's the Great Pumpkin, Charlie Brown to It's Arbor Day, Charlie Brown. 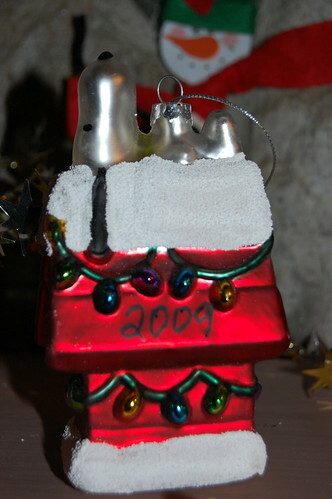 So we thought Snoopy on his decorated dog house would be a great ornament for 2009!